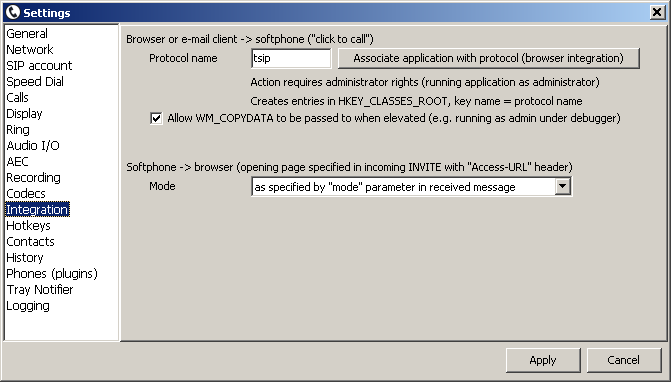 Access-URL is a non-standard SIP header intented to pass URL location between SIP endpoints. While it support is part of Asterisk "Dial" command since version 1.4 or so there is not much info available on this subject. Probably most notable is Polycom implementation: http://documents.polycom.com/topics/80391 allowing to pass link to xml page to phone that is able to display its content directly. With tSIP Access-URL works similarly to "HTTP query" function - opens passed URL in default browser. It may be configured to always open URL automatically, open automatically if "mode" parameter is set to "active" or always using manual mode - with dedicated button type. As always, global and/or local hotkey can be assigned to this button - in my opinion opening page automatically would be quite annoying and disrupting. At the moment only Access-URL in INVITE (i.e. asterisk "Dial") is supported, not in MESSAGE (asterisk "SendUrl").